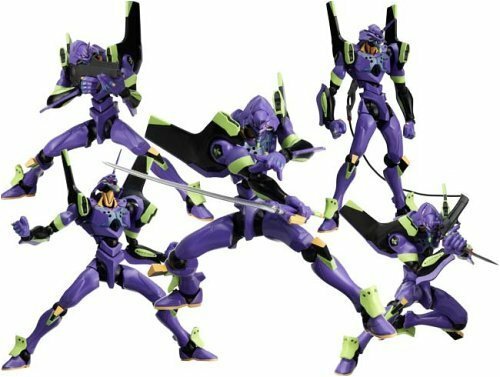 Armed with swords, knives, and more, it is even better than the best previously-released EVA-01 action figures, springing to life with so much fun you won't be able to put it down. * 'Shogouki' (or simply Eva Unit 01), the mecha piloted by Shinji Ikari is based on the famous Anime series Neon Genesis Evangelion. This hyper-poseable 6-inch figure can be put in so many poses, you won't know where to start! * Figure about 6 inch tall Awesomeness! Great detailing and sculpting. Very good representation of Shinji Ikari's EVA. Don't buy this figure! You'll want to have all revoltech series if you do! This was the first revoltech I got and now I'm emptying my bank account buying the rest of them. It's perfectly sculpted, it comes with several hands, a second berserk head, a gun, a rifle, a proggressive knife and a sword (I never saw it on the anime). It's perfect in all ways. I've been a fan of NGE for as long as I can remember, and I won't settle for anything but great quality. The figure itself is great and the joints are easy to move and stay in place. The package comes with extra hands that mate up with what ever weapons you want to equip. It comes with an EVA sized machine gun, pistol, bowie knife, and sword (I guess I'm not aware of Unit 01 ever using a..sword, lol) The construction on the sword isn't as great of quality as the rest of the package, but I won't ever use ..
Chroma (MN, USA) - See ..